Edward the Confessor was born at Islip in Oxfordshire around 1003. He was the eldest son of King Ethelred II "the Unready" and Queen consort Emma of Normandy. Danish incursions into England had become as regular as the seasons during the reign of Ethelred II. Lacking the ability to effectively combat the strong forces of the Danes, the king would instead make payments called Danegeld in return for a period of peace. Such payments were made by Ethelred first in 991 when he paid 10,000 pounds of silver after losing the battle of Maldon in Essex. He made such payments again in 994 after the Danes laid siege to London and again in 1002. The Danes had realized that it was quite profitable and easier to simply extort money in exchange for peace than to actually engage in battle to take England for themselves. With these large payments the Danes would grow even more powerful. In 1007 Ethelred paid 36,000 pounds of silver in exchange for two years of peace and again in 1012 paying 48,000 pounds of silver to turn them away. It became apparent that if you pay the danegeld, you never get rid of the Dane. By the summer of 1013 England was invaded once again by Danish forces under the command of King Sweyn Forkbeard and English resistance finally collapsed. As a result of the invasion, Edward's mother sent him and his brother Alfred to her homeland of Normandy to remove them from harms way. Edward was no more than 10 years old when he left England to begin what would be a long exile. It is there Edward is said to have developed the deep religious convictions he would hold through the rest of his life. The kingdom fell to the invaders quickly. King Ethelred was forced into exile and the victorious Sweyn Forkbeard returned home. Soon after his return home, Sweyn Forkbeard suddenly died in 1014 leaving his son Harold as King in Denmark. His other son Canute, who was left in charge of his force in England, was proclaimed King by his army. The nobility in England did not accept Canute as their king choosing to instead restore the exiled Ethelred to the throne. Canute was forced to return home where he looked to share power with his brother Harold. Harold chose instead to allow Canute to assemble and lead an even larger invasion force to take England and make it part of the growing Danish kingdom once and for all. There were so many kinds of shields, that you could have believed that troops of all nations were present… Gold shone on the prows, silver also flashed… who could look upon the lions of the foe, terrible with the brightness of gold, who upon the men of metal, who upon the bulls on the ships threatening death, their horns shining with gold, (who), without feeling any fear for the king of such a force. Moreover, in the whole force there could be found no serf, no freedman, none of ignoble birth, none weak with old age. All were nobles, all vigorous with the strength of complete manhood, fit for all manner of battle, and so swift of foot that they despised the speed of cavalry. The forces assembled under Canute clashed with the forces of King Ethelred who were commanded by his son, Edmond, known as Edmond 'Ironsides' for his relentless efforts to expel the Danes. Ethelred fell ill and died during this time leaving Edmond as King of England. Edmond became king of a nation in dire circumstances and by all accounts he ably and vigorously opposed the Danish occupiers. While the Danes laid siege to London, Edmund headed for Wessex where he gathered his forces. When the Danes pursued him he fought them to a standstill. He won repeated victories over Canute but was eventually decisively defeated at the Battle of Ashingdon in Essex. After the battle, the two kings negotiated a peace in which Edmund kept Wessex while Canute held the lands north of the River Thames. In addition, they agreed that if one of them should perish, territories belonging to the deceased would be ceded to the living. King Edmund II died in 1016 and as was agreed, his land went to Canute. Canute "the Great", the Danish King of England, would rule for 19 years. He took Edwards mother Emma as his wife in 1017 and their son, Harthacanute, would become his heir. Canute was generally thought to be an able and successful king credited for bringing two decades of peace and prosperity to England. Upon his death in 1035 he was succeeded in Denmark by Harthacanute, reigned as Canute III. He would also be King of England with Harold "Harefoot", Canutes son by his 'handfast' wife Aelgifu of North Hampton, as regent. 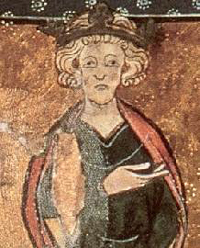 Harold "Harefoot" eventually took the crown for himself to rule as King Harold I when it became apparent that Harthacanute would not be able to claim the throne of England as he was engaged in a defense of his Kingdom against Magnus I of Norway and Anund Jacobs, King of Sweden. In an apparent attempt to remove Harold Harefoot from power, Edward and his brother Alfred Atheling returned to England in 1036. Alfred was captured by men loyal to Harefoot, possibly commanded by Godwin, earl of Wessex. While in captivity, Alfred was blinded and died soon after due to the severity of his wounds. Edward returned to exile in Normandy. Harold Harefoot died in 1040 just as his half brother Harthacanute was preparing an invasion force to unseat him having settled his disputes in Scandinavia. With Harold out of the way, Harthacanute was able to take the English throne with no resistance. Harthacanute invited Edward back to England in 1041 after almost 30 years of exile in Normandy to become a member of his household and heir to the throne. This may have been a compromise to keep the peace with powerful Anglo-Saxon leaders. Harthacanute died on June 8, 1042 never having married and with no known children. It was reported that he "died as he stood at his drink, and he suddenly fell to the earth with an awful convulsion; and those who were close by took hold of him, and he spoke no word afterward." Edward was crowned King of England on April 3, 1042. His reign was marked by relative peace and prosperity but there was conflict among the ruling class, especially between Edward and Godwin, the powerful Earl of Wessex, whom Edward believed captured and delivered his brother Alfred to his death at the hands of Harold "Harefoot". Having Spent much of his life in Normandy, understandably Edward brought with him Norman ways. This helped fuel a growing anti-Norman movement that included Godwin. In 1045 Edward married Edith of Wessex, Godwin's daughter. This marriage was possibly politically motivated in hopes that joining the two by marriage may help to ease the growing conflict. Edward only further aggravated the already volatile situation by rejecting Godwin's choice for the next Archbishop of Canterbury, appointing instead the bishop of London, Robert of Jumièges, a Norman. When in 1051 Godwin refused to punish those responsible for a riot by townspeople against Edward's kinsman, Eustace the Count of Bolegne, he exiled Godwin and his family confiscating their estates. His wife Edith was sent to live in a nunnery deprived of most of her possessions. In less than a year the powerful Godwin had returned at the head of a formidable army demanding to be reinstated and his lands returned. Looking to avoid a civil war, Edward reinstated him and his daughter in 1052. Godwin died the next year, he had always said he had no role in Alfreds fate and he is said to have denied it a final time as he died. His son Harold succeeded him as Earl of Wessex, an area then covering roughly the southernmost third of England. He, like his father, became the second most powerful person in England after Edward. Like his father, he also took a roll in the opposition of Norman influence in England. Harold had gained Edwards favor in a successful series of campaigns against the ruler of Gwynedd, Gruffydd ap Llywelyn, who had conquered all of Wales and negotiating with the rebellious Northumbrians against his own brother in 1065. Edward the Confessor died on January 4th, 1066, around the age of 63. He had ruled for 24 years. His death left four claimants to his throne. Edward had designated his great nephew, the Hungarian born Edgar Atheling, as his heir. Edgar was the son of Edward "the Exile" and the grandson of Edward "Ironsides", the great defender of England against the Danes. But Edgar was born in exile and had lived his life outside of England, he was a teenager and lacked sufficient support. 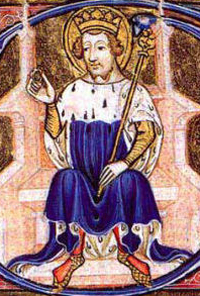 William of Normandy, the illegitimate and only son of Robert II, Duke of Normandy, said that he had earlier been promised the throne and further claimed the throne through relation to the King as great-nephew to Emma of Normandy, Edward's mother. Harold III of Norway Claimed the English throne based on a supposed agreement between King Magnus (his brother’s son) and Harthacanute whereby if either died without an heir, the other would inherit both England and Norway. He invaded England but he and his forces were slaughtered at the Battle of Stamford Bridge, outside the city of York, on September 25, 1066. He was defeated by Harold Godwinson, Earl of Wessex, who also claimed the English throne saying that Edward had made him his heir shortly before his death. Harold Godwinson was crowned king on January 5, 1066, with the approval of the Witenagemot (the assembly of the kingdom's leading notables). After demolishing the Forces of Harold III of Norway in the north he quickly moved his troops to defend against the invasion led by William of Normandy in the south. Harold and William clashed at the Battle of Hastings where, after a vigorous hard fought defense, Harold was killed and his forces routed ending his eight month rule and leaving William the Conqueror as the first Norman King of England. Under Edwards rule England prospered enjoying relative peace and security. 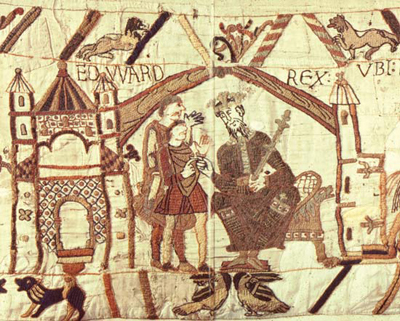 Edward claimed both Saxon and Norman lineage and his loyalties were inevitably split. His rule is considered the transition between Saxon and Norman rule. With him he brought Norman styles, language, and customs to the English court in a foreshadowing of the great change to come. It would not be until the reign of Henry II that Norman and Saxon Royal lines would again unite. It was during the reign of Henry II that the "cult" of Edward the Confessor rose to greater prominence and importance. 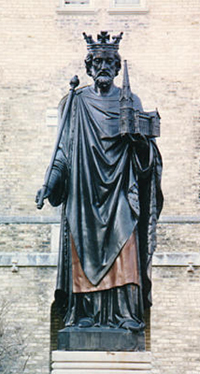 Osbert de Clare, a monk of Westminster, depicted Edward as a holy man who performed several miracles, having healed people with his touch among others. Because of these claims Edward was declared a saint and was canonized by Pope Alexander III in 1161. Edward was styled Edward the Confessor the patron saint of kings, difficult marriages, and separated spouses. Edward is credited with the building of Westminster Abbey around 1045–1050. He had selected the site for his burial and it was consecrated on December 28, 1065, only a week before his death. There are no portraits of Edward. When he is depicted, it is most often simply a representation of a generic king. It seems his appearance was anything but generic as he is described by his contemporaries. It is reported that his appearance was 'almost that of an albino'. He is said to have had 'full-flushed rose-red cheeks' that contrasted sharply with 'the milky whiteness of his flowing hair and beard.' His hands were white with long thin fingers described as 'transparent.' He wore his hair and beard long, more in the style of a Norman in contrast to the short close cropped hair common for a Saxon. Of his temperament it is said he gravitated to the extremes showing capacity for great kindness and also blustering rage. He is said to have been austere in his habits, described as 'old even as a child' with a 'recklessness and hardness' in his behavior to those closest to him. He was harsh towards his mother and alienated from his wife though he is said to have shown great kindness to the poor and suffering. He split his time between his two passions, the church and hunting.